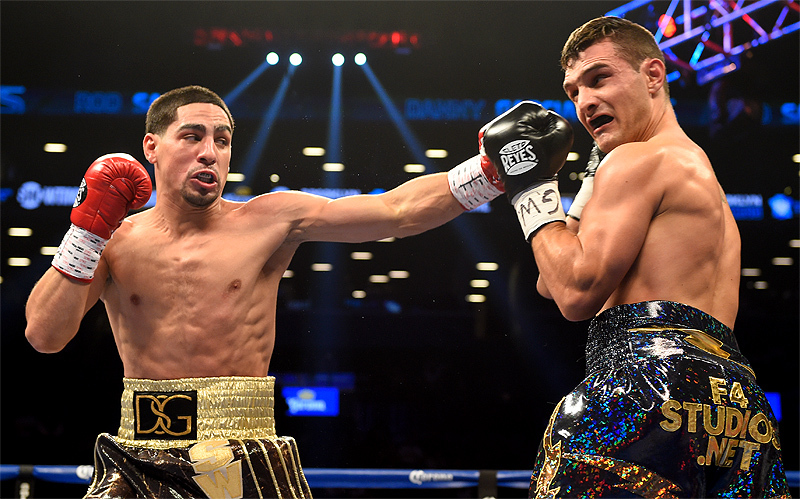 On September 14th, 2014 Danny Garcia scored one of the biggest wins of his career when he defeated the hard hitting Argentinean Lucas Matthysse by decision to retain his WBA and WBC Super Lightweight World Championship. Garcia’s biggest win prior to this fight was a stunning knockout over a two loss Amir Khan. The sky was the limit for the Philadelphia prize fighter and many considered him to be the best boxer in the junior welterweight division and Philadelphia’s best world champion since Bernard Hopkins. His other big victories were over faded veterans such as Erik Morales and Zab Judah, but those types of fights were to be expected for a rising boxing superstar trying to establish a name for himself. However, Garcia’s path to stardom has sputtered since that fight and the opportunities to grow his fan base have largely been ignored or have failed. Garcia’s first fight after his win against Matthysse took place in Puerto Rico against Mauricio Herrera, an opponent with three losses that many felt Garcia should beat easily. It was thought that Garcia, a Philadelphia native with Puerto Rican decent, would gain more fans by fighting in Puerto Rico and winning impressively. Unfortunately for Garcia and his handlers, he looked lackluster in this bout and squeaked out a decision in a fight that many felt he lost. Herrera threw more punches, landed more punches, and landed them at a higher percentage than Garcia, but somehow still lost the decision. Garcia failed to capitalize on the momentum from his major victory over Lucas Matthysse. Five months after that bout Danny Garcia knocked out Rod Salka, a blown up lightweight that was one win removed from a loss against the unheralded Ricardo Alvarez, and who had two other losses to an aged Dorin Spivey and another unknown Guillermo Sanchez. Even though the knockout of Salka was highlight reel material, Garcia and his handlers are still mocked for selling that terrible mismatch to the public. His next bout was against the always exciting Lamont Peterson in Brooklyn, New York. This was one of Garcia’s most exciting fights, but it was another fight that many felt he lost. Peterson came on strong at the end and looked like the fresher fighter, while Garcia’s face was badly bruised and swollen. Danny Garcia heard boos from the Brooklyn crowd. Garcia had a plethora of good fights that could have been made in the junior welterweight division after his questionable win over Peterson. Adrien Broner also fought for Premier Boxing Champions and would have been a good choice as an opponent. Cross promotional foes such as Terence Crawford or even Timothy Bradley would have made fight fans salivate at thoughts of that matchup. Even the legendary Manny Pacquiao was brought up by many in boxing circles as a possible future foe for Danny Garcia. Instead, Garcia chose to fight a six loss Paulie Malignaggi, an excellent talker and great boxing commentator, but he was coming off of a devastating TKO loss to Shawn Porter. Garcia won that bout, but it did nothing to elevate his career. Even though good options remained for Danny Garcia at the junior welterweight division, he bumped up in weight and took on Robert Guerrero, a man that previously held a featherweight title and had only won two of his previous four fights. One of those wins included a split decision victory over the unheralded Aaron Martinez in a bout that many thought he lost. Garcia won the fight with Guerrero, but Guerrero went on to lose his next bout to David Peralta, a boxer who’s full time job was that of a cab driver in Argentina. But despite all of these missteps and uninspiring victories by Danny Garcia, his biggest misstep was announced this week. Danny Garcia, despite being a WBC Welterweight World Champion, will take part in a tune up fight against Samuel Vargas. Who’s Samuel Vargas? That’s a good question, because he’s not well known. He played the role of punching bag to Errol Spence Jr. in April of 2015. The same Errol Spence that Danny Garcia said wasn’t ready for him, because Errol Spence had to prove himself to get big names in the ring. Samuel Vargas’ other loss was to Pablo Munguia. Pablo Munguia has lost six of his past seven bouts, and has been stopped in over half of his eleven losses. Samuel Vargas has done nothing to prove he belongs in the ring with Danny Garcia. What’s even more outrageous about this fight is its timing. Boxing is struggling to find and grow new fans, and this is evident in the noticeable decrease in number of boxing gyms nationwide and the lack of boxing on US television in the month of October. Danny Garcia is a Philadelphia fighter, and Philadelphia is a major player in the sport of boxing. Garcia has not fought in Philadelphia since 2010, and at first glance one would think that letting Garcia fight in front of his home town is a good idea. Except for there’s another Philadelphia fighter fighting on November 12th, and he holds the UFC Lightweight Title. He’s also fighting the world’s most popular MMA fighter in Connor McGregor, for the first UFC card ever in the media capital of the world, New York City. There’s no overlap of fans in boxing and MMA amongst the older generations, but you’d be foolish to think an overlap doesn’t exist in the coveted younger demographics. Fight fans under the age of thirty five that live in Philadelphia would pay attention to Danny Garcia fighting in their city on most nights, but not on a night that Eddie Alvarez is fighting McGregor. You’d also be foolish to think the Philadelphia media won’t cover a local native like Eddie Alvarez taking on the biggest name in the UFC over a bout between Danny Garcia and an unknown in boxing like Samuel Vargas. That fact alone, defeats the purpose of having Danny Garcia fight in his hometown. I’m sure the promoters will stack the card with local fighters in an effort to get the local gyms to pack the Liacouras Center at Temple University to make it seem like it’s a triumphant homecoming for Danny Garcia. But the majority of fight fans in Philadelphia will have their eyes on New York. Win or lose, this fight for Danny Garcia is already a failure, and just another questionable decision in Danny Garcia’s career.